The Flexible Studies Program uses the acronym VOICES to summarize our educational philosophy. In providing opportunities for students to engage with content in meaningful and relevant ways, to explore ideas and questions of their determination, and to share all of this with our community, we believe that students will be engaged and engrossed with their education. There is an English option and a French Immersion option for the junior Flexible Studies Program (grades 9 & 10). Students are accepted into either the English option or the French Immersion option. There is no distinction between the French Immersion and the English programs at the senior level. 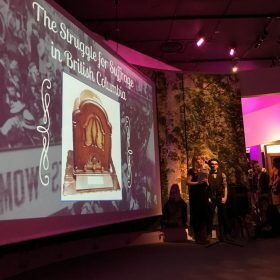 The English option offers multigrade learning opportunities. Students in the English option complete their grade nine and ten learning outcomes for English, Social Studies, Science, Environmental Science, Career Life Education, and an Independent Directed Study – in a structured inquiry-driven model of learning. Mathematics will be completed in a grade specific, semestered class with a Flex teacher and a mixed cohort with French Immersion Flexible Studies students. The junior French Immersion option of the Flexible Studies program is a two-year program where students take a full French Immersion timetable along with Flex English and Flex math. Flex English and Flex math classes are offered in a blocked timetable and students are grouped by grade-level. Mathematics will be completed in a grade specific, semestered class with a Flex teacher and a mixed cohort with English Flexible Studies students while English will be completed in a grade specific, semestered class with a Flex teacher and a cohort of Flex French Immersion students . In the senior years of the Flexible Studies Program, there is no distinction between English and French Immersion options. Flexible Studies program students will continue with Flex Service 11 and 12 and also have the option to continue in Pre-Calculus 11 and 12 with a Flex cohort. As there are many additional course options for students at Reynolds when entering their senior years, we want to remain flexible to ensure students can take advantage of courses that will meet their personal needs. With that said, we have some recommended choices for Flexible Studies students who want to continue with a similar philosophy of learning in their senior subjects. The 2019/2020 Junior option Flexible Studies Program Application Packages can be found here. The same application is used by both English and FRIM applicants. The completed application is due to Reynolds Secondary by 1pm on Friday January 25th, 2019. Applications for grade 10 students entering either the English or French Immersion option of the Flexible Studies Program are accepted, but acceptance to the program is contingent on available space. The above application is also used for students looking to enrol in grade 10. 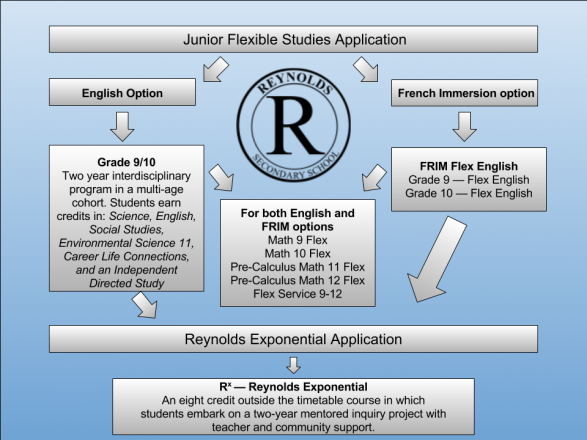 Reynolds Exponential proposals happen near the end of a student’s grade 10 year and in consultation with Flex teachers.